Tucked away at the end of a side street in Lisbon, you might stumble upon this ancient looking structure - and wonder what it's for... and why there is a constant stream of people entering... and happy people leaving...! The building forms part of Lisbon’s Águas Livres Aqueduct, commissioned by King João V in 1731. One of several water cisterns, fed from the mountains, it's part of the ancient fresh water system. An engineering masterpiece in it's own right, what is more exciting still - is that it's been converted inside into a fantastic wine bar. 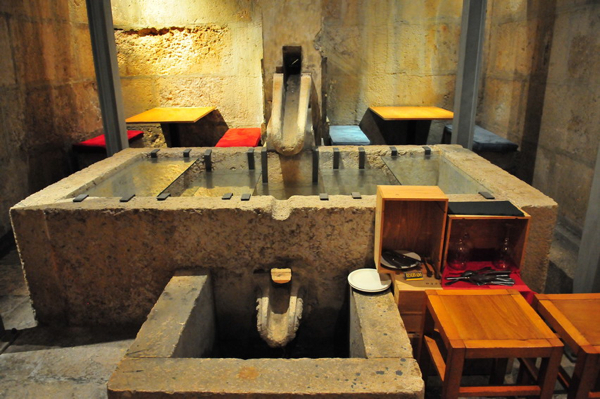 With hundreds of wines, the Chafariz da Mãe de Água (literally, spring of the well-head), specialise in pairing food and wine together - getting the best from the food - and best out of wine. Even a simple plate of cheese tastes amazing! They serve a selection to set menus, snacks and different tapas dishes. With thick stone walls, and long passages, the room remains cool in the height of summer - a welcome escape into a cave of wine filled happiness. If you love wine, you can't fail to LOVE this place... and if you don't yet love wine - come here to discover your Love! Cheers ! To your very good health! Many tourists will note the gigantic set of arches spanning the Alcântara valley, ending at the reservoir of Amoreiras. Its source is known as Águas Livres (free waters), located in Caneças (some 18,5 km away). However, the aqueduct is in fact much more than this. It consists of a complex series of underground galleries, arches and skylights linked to the visible principal body, known as the General Aqueduct. These are scattered all over the city, giving rise to numerous fonts which, in times gone by, were important sources of water supply for the city. Altogether the network consisted of 58 km of water conduits, 109 arches, 137 skylights and 30 fountains. As such, it is considered unique. The Chafariz da Cotovia de Baixo, situated on the Praça da Alegria, dates from a later period of construction and Reinaldo Manuel dos Santos, who was in charge of the project between 1772 and 1791 is thought to be responsible for the design. 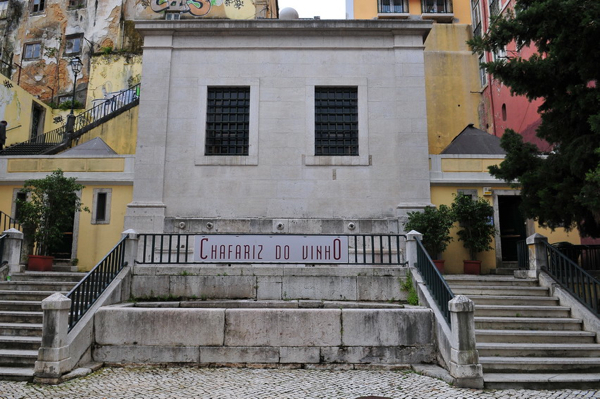 In 1840, this fountain was transferred to the Rua da Mãe-de-Água, at which time the façade suffered some changes. 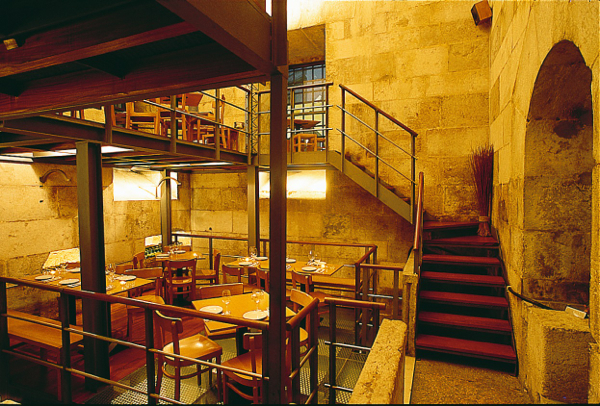 It was at this time that it came to be known as the Chafariz da Mãe-de-Água, and it is this space that the wine bar now occupies. The underground plan of the aqueduct is composed of vaulted galleries designed to human scale and stone conduits through which the water used to run. The street gave public access to the supply points. Indoors, the spout on the lower floor was only for the water that wasn’t used. On the outside, on the lower platform linking the two flights of stairs, there is a small well which allowed animals to quench their thirst. 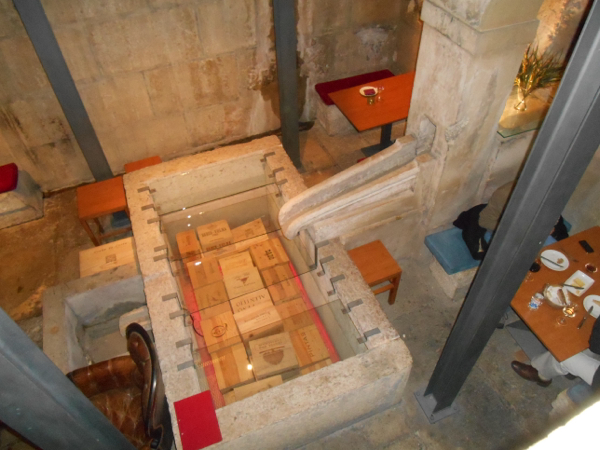 You might also want to check out the water museum and aqueduc tour which takes visitors through the underground galleries from the Patriarcal (Príncipe Real) to the Chafariz do Vinho (Praça da Alegria). Informations Epal Monday to Saturday, 10 a.m. – 6 p.m.
Vítor Carriço of the Turismo de Lisboa Visitors Bureau, for his support in planning this trip. This converted mountain-top windmill has the best ocean views!